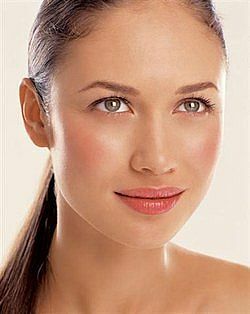 A healthy, gorgeous glow and juicy vibrant, younger looking skin is what we all strive for and try to achieve. So when NeoCell contacted me about reviewing their exclusive collagen products, I couldn't wait! Collagen is what keeps our skin looking vibrant, young and youthful. So if you're looking for fast results for a more youthful, brighter you, read on because NeoCell's high quality Collagen products are definitely going to help you achieve those results. 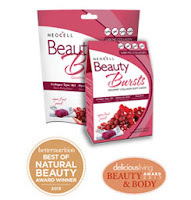 Here is my review of the NeoCell Glow Matrix and Beauty Bursts collagen products. NeoCell's Glow Matrix provides scientifically advanced ingredients designed to internally hydrate the skin. Their premium formula supports the skin’s lipid barrier which helps to lock in moisture and smooth the skin. 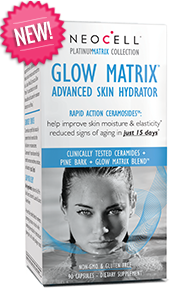 Glow matrix has been shown to help improve skin moisture & elasticity, reduce the signs of aging in just 15 days, increase smoothness, moisture and elasticity. The key ingredients are: Hyaluronic Acid, (one of the best moisturizers for skin), Pine Bark Extract, Astaxanthin, Lutein & Coconut Water Powder. Also, a scientifically crafted blend of nutrients promoting hydration in the skin while combating free radicals for hydrated and glowing skin and a healthy collagen matrix. This product is fantastic! If you're looking for a youthful glow with smoother skin and diminished or no fine lines and wrinkles, you definitely want to try Glow Matrix! I had amazing results with this product and will continue to buy it. Your skin not only looks smoother but has an amazing illuminated glow from within. My skin appeared smoother, plumper and glowing thanks to Glow Matrix! I could even go makeup free most of the time and people thought I had some sort of illuminizer on. It made a huge difference in my skin overall and I got compliments on my skin while taking this product. I definitely recommend you try it! NeoCell Beauty Bursts are infused with high quality beauty nutrients in delicious, gourmet soft chews. They contain Collagen Type 1 & 3 is the body's beauty protein & strengthens skin, hair & nails. They also contain, the (mega hydrator) Hyaluronic Acid, also known as "Nature's Moisturizer" & hydrates the skin and Vitamin C which is essential to boosting collagen in the skin. Together, these three powerful natural beauty nutrients work together to build beautiful skin from the inside out. I tried the beauty bursts in fruit punch and their really good! I noticed even better results while taking them. I believe these little chewy gourmet candies are the key to smoother skin and strong hair and nails. Their kind of addicting, actually. At times I would forget I already some and would have a few more. They also have other delicious flavors like chocolate mint and acai berry - yum! My overall experience with these products has been nothing short of amazing! I took the beauty bursts in addition to Glow Matrix supplements and I noticed even better youthful glowing results for both skin and hair! These high quality natural based products gave me a completely line / wrinkle free face with a youthful glow. These little chews are easy to take and go if supplements aren't your thing or if you don't want to take another pill. Just google NeoCell Collagen and you will be amazed at the before and after photos! Watch this video from New Beauty featuring NeoCell Collagen products: https://www.youtube.com/watch?v=bp6_cm60hI4. NeoCell gives back too which is why I love them even more! In 2011, NeoCell partnered with Vitamin Angels and has since helped over 1,000,000 at-risk mothers and children get the essentials their bodies need to survive, thrive, and reach their full potential. In 2012, NeoCell was honored to be recognized nationally for their environmentally-friendly PCR packaging. I try to support companies that care enough to give back to the community. This is definitely a company we should support. NeoCell is the #1 collagen brand in the world and a leader in the field of nutritional science. They've also won multiple beauty and health awards. You can learn more or purchase these products by visiting their website at www.neocell.com. You can get updates on their company and products by connecting with them on Facebook, Twitter and Instagram.